Online education or e-Learning is now the most trending around the world. With the power of Internet, high-quality education can be distributed to everyone. So, today I would like to instruct you how to create an eLearning website to share your knowledge or skills to others using one of the most popular WordPress LMS plugins recently -LearnPress. In order to get the best power of this plugin, I will use Education WP by ThimPress. This is the first and only education theme applied the 1.0 stable version of LearnPress. 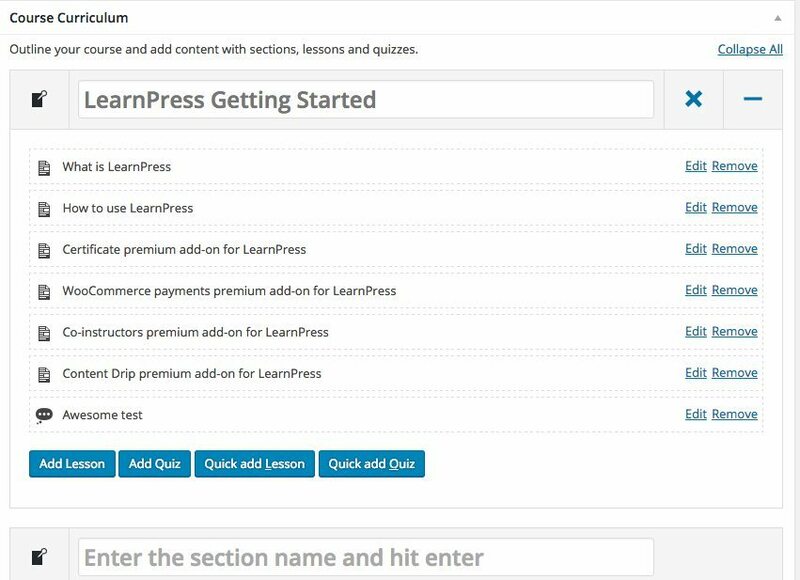 As I was very impressed with the beta version of LearnPress, I really look forward to seeing new features and easy & stable functions from this famous plugin. The first impression about the Education WP is it has the better UX than his older brother – eLearning WP which also uses LearnPress for creating Learning Management System. As a premium template, this education theme provides a pack of paid add-ons which value up to $500. Those add-ons really complete LearnPress and its system for LMS options. Moreover, Education WP combines LearnPress’ power with the strength of WooCommerce to make your site become a learning institution as well as an e-Commerce site. It is great to have event management plugin built-in to easily add and modify events. Education WP also inherits from his brother the customization ability with all options in one single page which allows you to see intermediately changes. Users can quickly edit the front page without any problem. One more thing that makes me fall in love with this education theme is the Site Origin Page Builder, with the latest version. Education WP provides simple ways to create beautiful pages or posts just with drag and drop elements and a little edit. All features save you a lot of time to build a fully functioned e-learning site. Moving on the main part which I would like to deliver to you today is the learning system. LearnPress gives you the ability to create and manage course, lessons, and quizzes easily with the friendly user experience. E-learning in LearnPress contains “courses”, each course is divided into sections, each section includes lessons and quizzes. It just likes many other LMSs. The special thing is you can quickly create this curriculum in only a couple of minutes with LearnPress Curriculum. 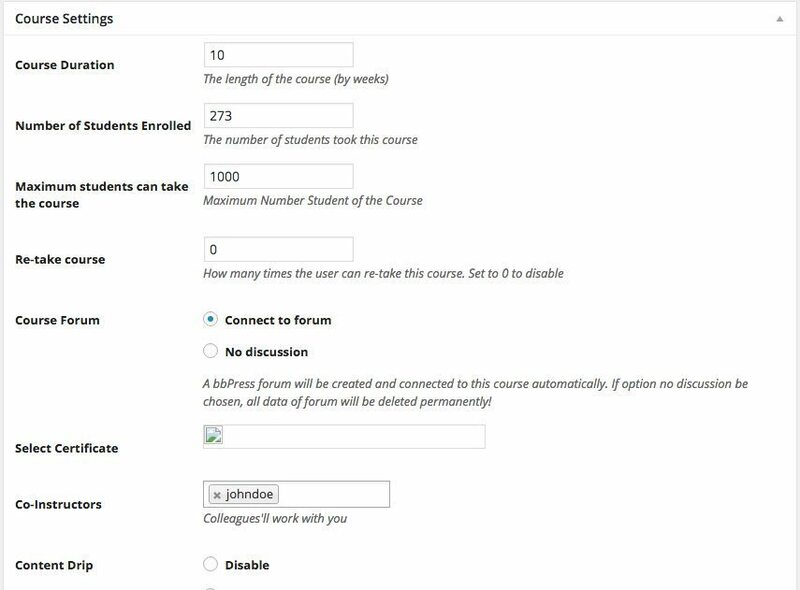 After making the outline of the course, you can come up with the course settings, it is also simplified with necessary options only. 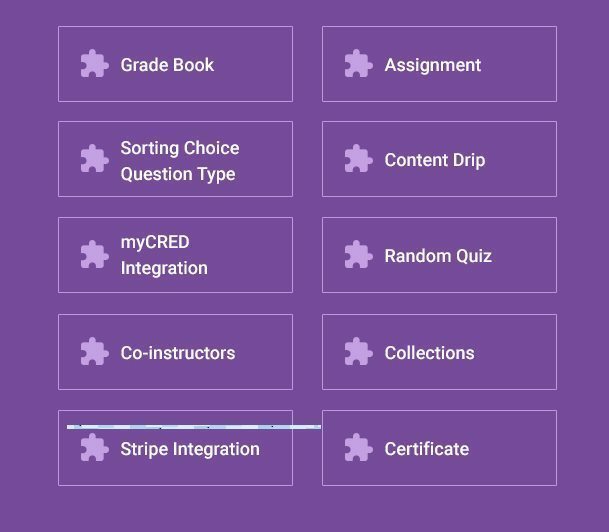 You might not see the “Course Forum”, “Select Certificate”, “Co-Instructors” and “Content Drip” options, cos the add-ons for those are being required to install. However, using Education WP you will have them all. 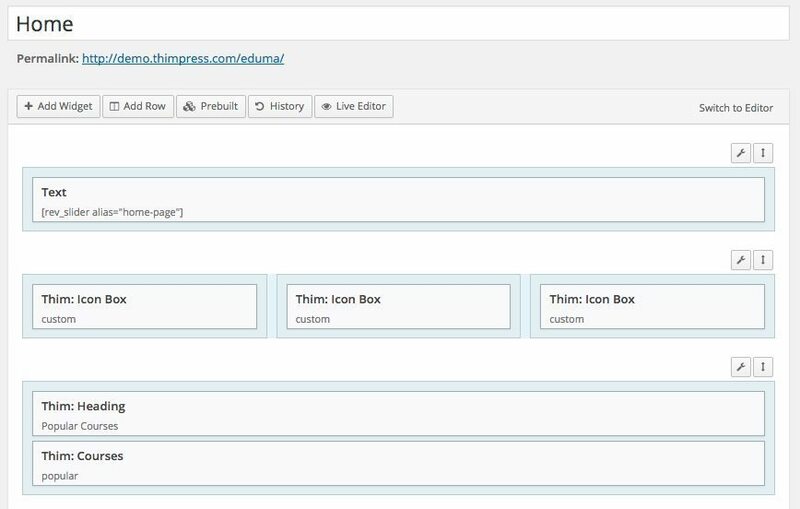 Lesson is another kind of post in WordPress with addition options. A lesson can be a video, text or other types. 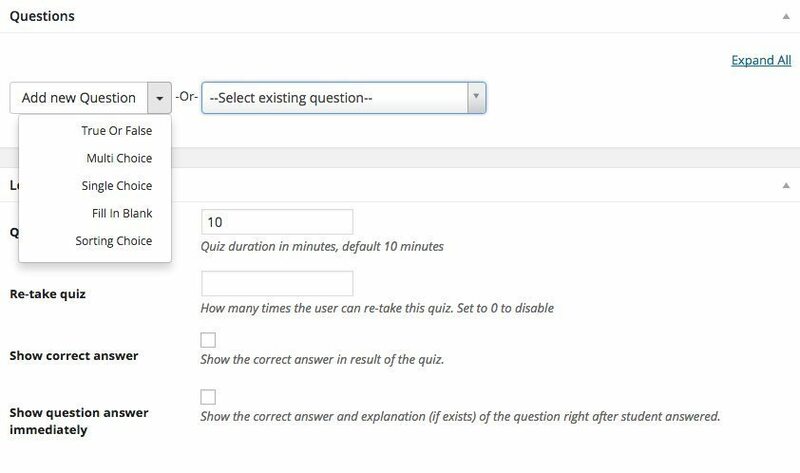 Quizzes are built seriously with a lot of efforts in LearnPress. They can be time limited or not. There are five question types for you to choose. 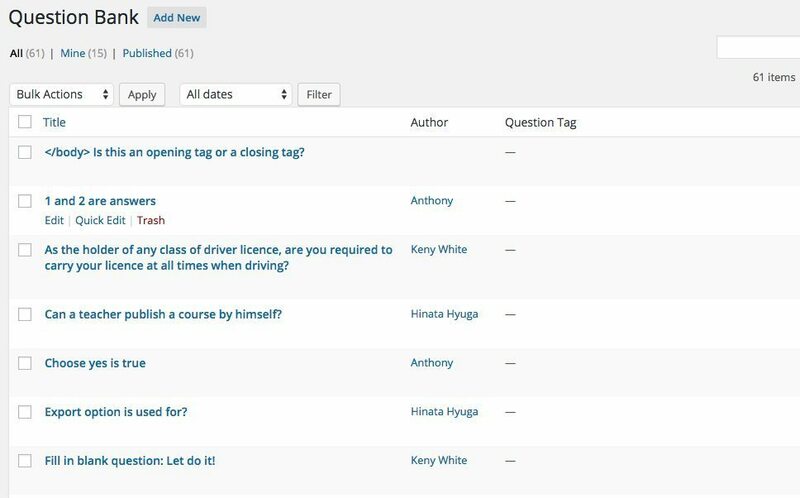 You can add new question directly in the add quiz page or you can select question from your own question bank. 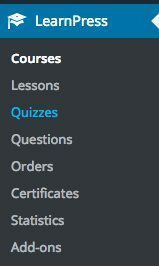 And finally, courses can be set as free or paid in the course settings. If it is a paid course, there are several payment gateways that LearnPress supports for you: Paypal, Stripe or WooCommerce methods. Whatever you choose, you also can manage all your orders in the menu list. Thimpress runs a great support system, so if you get into any trouble, just create a ticket on their support forum and they will help you solve it. However, the UX of the theme is really friendly and easy to use. 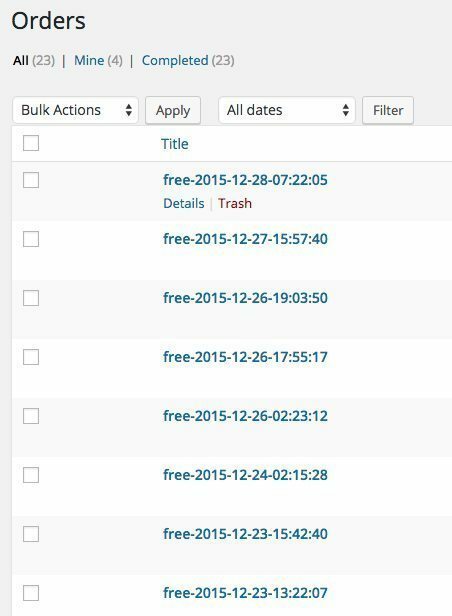 If you are a frequent WordPress user like me. I guess troubles during usage of Eduma are rare. Education WP is a premium education theme specified for creating an e-learning site. It can save a lot of time for you. With $59 for a regular license, you can own a pack of premium add-ons which can help you build a fully function LMS site in a couple of days instead of weeks trying to edit a multipurpose theme and a bunch of plugins. However, it is up to you to choose the way you go. Personally, I highly recommend you to use Education WP to make a great education website. This theme looks great. Do you have any idea if this theme is compatible with multilingual plugins like WPML? Thanks Nadine, Yes, It’s compatible. Is it possible to synchronize LearnPress with Event Manager so that they share the same database (tables). Please I need help with this theme. How can I contact you? Hello , Thank you for this opportunity, am currently using or trying to use the Eduma theme, however my developer who claims to be a WordPress developer is doing a bad job, the UI/UX is awful, content placement is off and so on, please i need help, kindly review my website and tell me what you think and what can be done. It is www eduxtra.com.ng. Thank you.